In August, Cardiff’s iconic 1980s gay bar ‘The Tunnel Club’ reopened for one night only. As a younger member of the LGBT* community in Cardiff, it was a valuable opportunity to take a glimpse at the way things were back then and to engage with our collective history. However, what was particularly striking was the scarcity of women; a state of affairs, which I am reliably informed, was much the same back in the day. And not much has changed. The bars and clubs of Churchill Way and Charles Street are home to an array of mesmerising drag acts, strobe lights and adventurously named cocktails, but often very few Lesbian, Bisexual or Trans* women! We’re definitely out there. You can take that from the gaydar-equipped amongst us. Personally, I struggle to step outside my front door without encountering an alternative lifestyle haircut, practical footwear or a discernible love of cats (to pick out a few tell-tale indicators). But where are we hiding? My suspicion is that the answer to that would be – safely ensconced in our houses, with our partners and feline friends, listening to Tracy Chapman and netflicking our way through seasons one to three of Orange is the New Black. Which leads me on to the more worrying thought – do these women not realise that every Wednesday, on a leafy street in the centre of Cardiff a flock of women (greater in numbers than ever graced the floor of ‘Candy Bar’) get together to make sweet music; combining the joyful and health-enhancing activity of collective singing with an active social scene????? And what is this mystical musical rainbow collective you ask? Songbirds Choir of course! 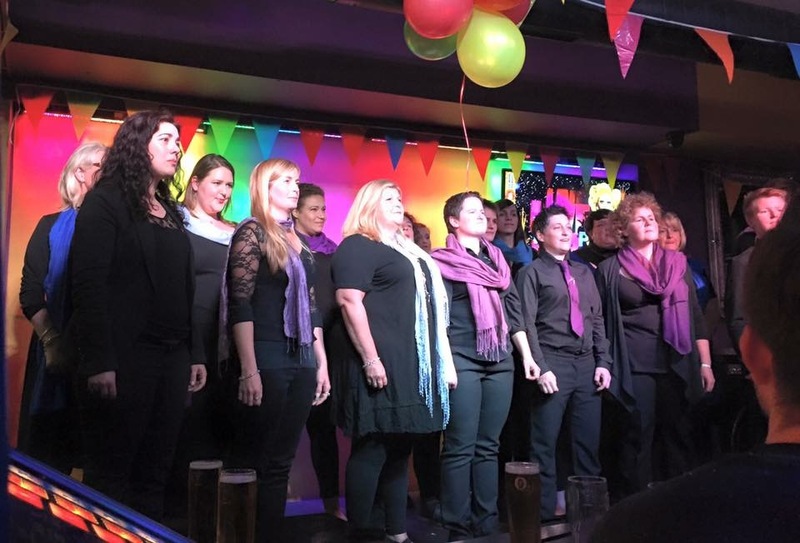 Songbirds is a community choir, specifically for self-defining Lesbian, Bisexual and Trans* women in South Wales. We have performed at venues such as the main stage at Cardiff Mardi Gras, Wow, Pulse, The Gate, Cardiff University, the National Assembly for Wales; to name but a few. We also sing at fundraisers, weddings and the odd christening! And of course, we have a great time doing it! Our repertoire is varied, but mostly consists of contemporary songs, musicals, and spirituals. We are an exceedingly social bunch and over time have become the greatest of friends. We often go out for meals, away for weekends, sing a spot of karaoke, party the night away and generally look out for, and after each other. 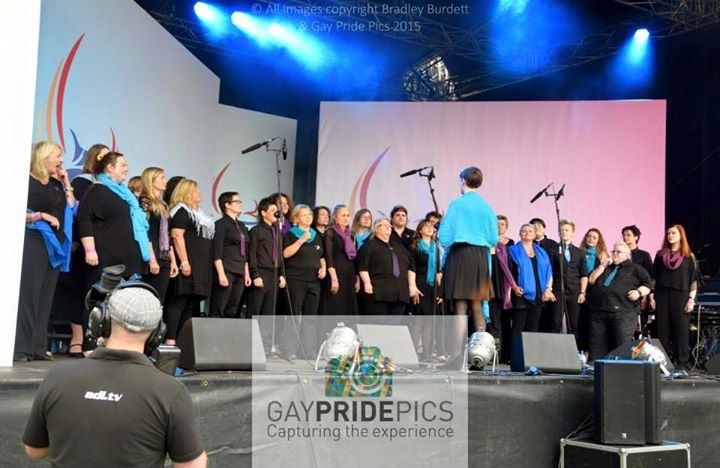 As a community choir, we are a mixed bag – in age, in lifestyle, in gender identity and presentation, some of us with disabilities, and some of us with families; so when we come together, we are a bold handful of possibilities. We are strong family, where everyone is welcomed, no one is judged, and where everyone and every contribution is valued. The beauty of it all is that we can make space for so many more. Do you have to be LBT to join? Yes. Do you have to be a proficient singer or read music? 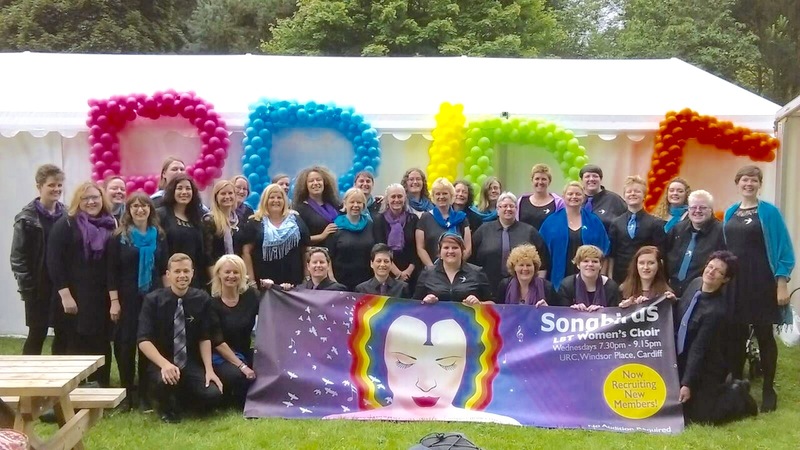 Not so much… Songbirds is a non-auditioning community choir with a great mixture of abilities. If you enjoy singing that’s plenty good enough for us! We are in the process of recruiting, to strengthen our current membership of 44 and in the hope that those who yearn for friendship, or a sense of community, but do not like the scene, or are looking for something a bit different will be lured out of their cosy homes!!! We meet at City United Reformed Church, Windsor Place, Cardiff every Wednesday at 7.30pm. If you would like to come along to join the choir, or just for a listen, please do! We also have our Christmas concert coming up at 7.30pm on Monday 14th December at Jolyons, 10 Cathedral Road, Cardiff. Do come along!